(CNN) -- Amanda Knox's parents are hopeful that an Italian court's decision not to re-evaluate the evidence against their daughter means she will be found not guilty of killing her roommate. Edda Mellas and Curt Knox say they have never believed their daughter was guilty. "We asked for the independent review because we were sure that anybody [who] independently looked at it would support our position," Edda Mellas, Knox's mother, told CNN's Larry King in an interview to air Friday night. "Now, maybe the court decided that they don't even need that support. That our arguments have already been good enough." Knox, of Seattle, Washington, has been in an Italian jail and on trial for nearly two years on charges that she helped murder her roommate, British student Meredith Kercher. Knox's defense lawyers had asked the court for an independent review of the evidence, which can be requested if there is contested or contradicting evidence. Prosecutors say a kitchen knife, allegedly the murder weapon, has Knox's DNA on the handle and Kercher's DNA on the blade. The defense disputes that, but last Friday, the court denied the request for a review. 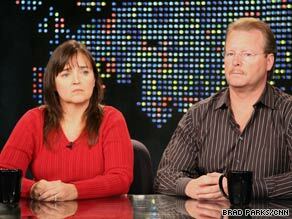 Her father, Curt Knox, told CNN that he thinks Amanda Knox was targeted as a suspect from the beginning. Within days of Kercher's murder, Knox and her then-boyfriend, Raffaele Sollecito, were questioned and portrayed in the media as the undisputed killers. The parents of Amanda Knox tell why they're fighting to prove their daughter's innocence. "I believe that there was a huge mistake made very, very early on by, you know, having a -- literally a 'case closed,' you know, presentation by the police over there," he said. Prosecutors held news conferences weeks after the killing, declaring the case solved. Knox, Sollecito and bar owner Patrick Lumumba were believed to have killed Kercher during a sexual game gone horribly awry. Knox was criticized in newspapers and tabloids around the world for her demeanor after the killing, which included photos of her and Sollecito comforting each other as crime scene investigators looked for clues in her house. Knox's mother told King that those headlines couldn't be further from the truth. "You know, she's very much a person who internalizes," Mellas said. "She was extremely upset, and her roommate testified that when she found out it was Meredith that was killed, she was very upset. She cried; she did all of that. But by the time those photos were taken, it was hours later, and she was being comforted by Raffaele." As the investigation went on, the scenario of what happened changed. Lumumba was released because he had an airtight alibi, and DNA evidence from the crime scene soon pointed to a different suspect: Rudy Guede. Guede was sentenced to 30 years for the murder in a separate trial and is appealing the verdict. Knox's parents believe that Guede is the sole killer, but because the prosecution hammered the idea that Knox and Sollecito were guilty, they couldn't back away from it. "They were just too far into it, and they've been trying to press it ever since," Curt Knox said. Knox's family and friends insist that the girl they know wouldn't kill anyone. Her parents say they never believed that she was guilty. After the murder, Mellas said, friends and family told Knox to leave Italy -- to either come home or stay with relatives in Germany -- but Knox refused because she wanted to help find the killer and prove that she had nothing to do with it. "Many people asked her to leave, but she said no. 'I'm going to stay. I'm going to try and help. I'm going to try and finish school,' " Mellas said. Looking back, her parents wish Knox had left. Now, all they can do is wait -- and hope things turn out how they believe they should. "We have to believe that what they're hearing in court -- and it's so clear that she had nothing to do with it -- then they'll come out with the right answer," Curt Knox said. "I mean, that's -- that's what we have to believe."